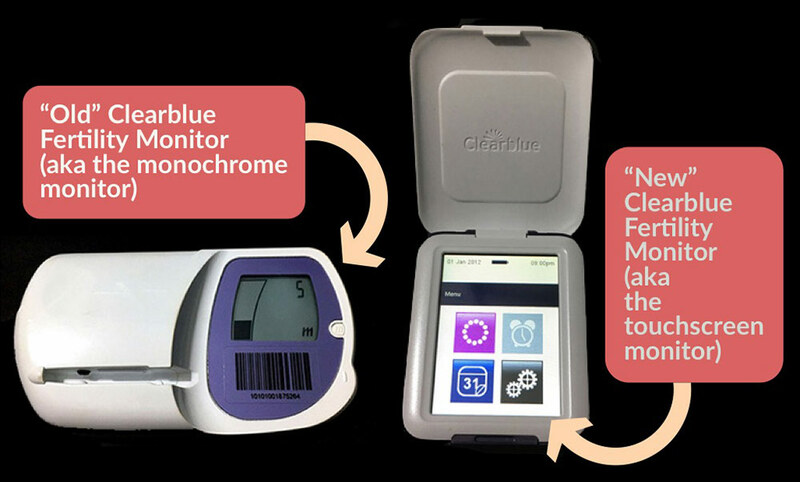 Are you in the market for a Clearblue fertility monitor? Perhaps you’re just getting set up with the Marquette Method of NFP, and need some help choosing which monitor model best suits your needs. Or maybe you’ve been practicing Marquette for a while, but today your toddler threw your monitor in the toilet and … yea, you’re searching the internet for advice. 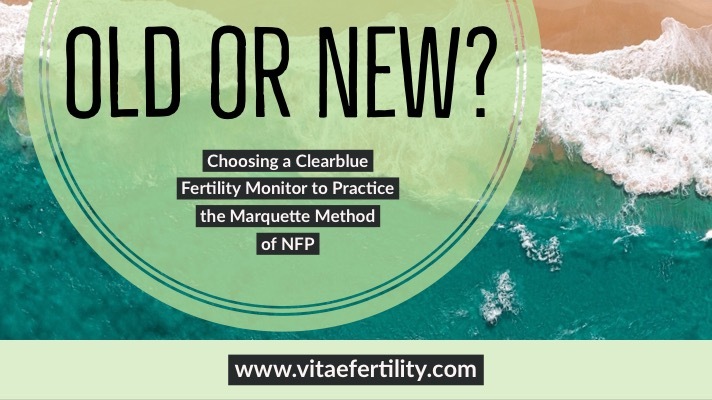 If you’re about to buy a Clearblue fertility monitor to practice the Marquette Method of NFP, you’re probably facing what seems a daunting task—choosing between purchasing the “old” monochrome monitor or the “new” touchscreen monitor. Which monitor should you choose? The short answer: It doesn’t matter! Both monitors are 100% compatible with the Marquette Method of NFP. They measure the same hormones. They use the same test sticks. They provide identical test results. And the million-dollar question … yes, the Marquette Method of NFP is equally effective regardless of which monitor you choose. So, if you’re already yawning, just go ahead and buy the newer touchscreen monitor. It’s much easier to find (because it’s the one that’s currently in production) and it’s typically cheaper, too. It’s a great choice. However, if your sister-in-law just gave you a free monochrome monitor, then go ahead and use it. It’s also a great choice. However, if you’re the type that wants to know All. The. Things. (hello, nice to meet you, that’s me too) then read on as I explain how some very slight differences between the monochrome and touchscreen monitors that might sway your choice. The Clearblue fertility monitor tracks a woman’s fertility throughout her menstrual cycle. Specifically, it measures a woman’s estrogen and luteinizing hormone (LH) levels. Typically, women’s estrogen and LH levels are low at the beginning of a cycle, so the monitor returns a “low” fertility reading. As estrogen levels begin to rise, the monitor returns a “high” fertility reading. Then, when the monitor identifies an LH surge, it returns a “peak” reading. A peak reading means that the woman has reached the peak of fertility for that cycle, and ovulation will occur in the next few days. The monitor will never ask for a test on cycle days 1 to 5. Why? Because the research shows that if a woman has regular-length cycles and if she’s confirmed ovulation in the previous cycle then the first five days of a menstrual cycle are infertile. Once the monitor detects an estrogen rise, it will display a high reading and then continue to display high readings until a) it detects an LH surge or b) it reaches cycle day 25 without detecting an LH surge. Why? The monitor was designed for women in regular cycles, and this is precisely the normal progression of hormone fluctuations for a regularly cycling woman—estrogen levels rise as an egg develops in a follicle, and then the follicle is ruptured by an LH surge. The monitor will ask for a maximum of 20 tests per cycle . Why? Women with regular-length cycles (and without underlying medical conditions) will generally experience an LH surge by cycle day 25. If the monitor hasn’t identified a peak reading before the 20th test (cycle day 25), it assumes that it missed the LH surge, and it will begin returning automatic low readings, without asking for tests. Following the Marquette Method Regular Cycles Protocol with regular-length cycles? Touchscreen. If you’re a woman following the Marquette Method Regular Cycles Protocol who generally experiences regular-length cycles, these little nuances probably won’t affect you. Frankly, you probably won’t even notice them. If this is you, you’ll probably want to go ahead and buy a touchscreen monitor. However, if you’re using the Marquette Method while breastfeeding or you have some “special circumstances” then above-mentioned nuances of how the monitor works might make one monitor model a more convenient choice for you than the other. Read on. Anticipate frequent hard resets? Touchscreen. Women go through some fertile phases (such as breastfeeding women, once cycles return) when the method prescribes more frequent hard resets (don’t worry, your instructor will explain when and why) … if you happen to be one of these women, anticipating a lot of hard resets, you might prefer the touchscreen monitor. It’s just significantly easier to wipe the touchscreen monitor’s memory. It’s less of a finicky process on the touchscreen monitor than on the monochrome monitor. Some breastfeeding women in “cycle zero” and women with long cycles or irregular-length cycles prefer the monochrome monitor. The Clearblue fertility monitor only allow users to test, at a maximum, for 20 days per cycle. If a woman reaches this point without detecting a peak reading, her instructor is likely to advise her to set up a new cycle on the monitor in the middle of her actual (biological) cycle. In these cases, the monochrome monitor allows women to fast-forward through cycle days 1 though 5, and the monitor will ask for a test on the following day. The touchscreen monitor only allows users to advance up to cycle day 4, which leaves cycle day 5 (or “monitor day 5,” as I call it in my Marquette Method Breastfeeding Manual) as a day when you can never test with the monitor. Women in cycle zero or with very long cycles using the touchscreen monitors will have to skip a day of testing with the monitor each time they set up a new cycle on the monitor in the middle of a biological cycle. It’s a bit of an inconvenience, but it’s actually not such a big deal. The Marquette Method is robust enough to handle this, and your instructor will advise you on your options for how to proceed on this day of no testing. Busy mornings, busy life? Touchscreen. The monochrome monitor is very specific about the time that you set up a new cycle because the time when you set up a new cycle determines the mid-point of your 6-hour testing window (the period of time each day during which the monitor will ask for and accept a test). If, for example, you set up a new cycle at 8:00 a.m., your testing window will run from 5:00 a.m. to 11:00 a.m. So for the monochrome monitor when you set up a new cycle is important, since it determines the beginning and end of your testing window for that cycle. The Marquette Method recommends that you test with your first morning urine, so most women will want to set a morning testing window. You might prefer the touchscreen monitor if mornings in your house are already busy enough, or if you’re simply not functional until you’re fully caffeinated. With the touchscreen monitor you can set up your cycle at any time of the day, and choose any testing window you desire. If periodically setting up a new cycle on your monitor at a precise time in the morning sounds like a chore you’d rather avoid, choose the touchscreen monitor. Should I buy a new monitor when my circumstances change? Clearblue fertility monitors aren’t cheap! Both models of the monitor are 100% compatible with the Marquette Method, no matter what your fertile phase or special circumstances. The Marquette Method is equally effective regardless of the specific monitor model you are using, and your instructor will guide you in how to use your monitor to practice the method correctly for your specific circumstances. Marquette Method instructors are experts when it comes to knowing how both of the monitors work and making them work for you, your body, and your cycles. Go ahead and make the choice that makes the most sense for your life and your budget, and then check this one off your to-do list! So it doesn’t matter if you buy an old or new monitor to start nfp. But how long can you use your old monitor before you need a new one? I purchased my monitor in 2010 and I’m beginning to wonder if I need a new one. That’s a good question! It’s hard to predict how long your analog monitor will last – I’ve heard of women using theirs from the early 2000’s and not having issues with it. As long as your monitor turns on, you can still rely on it to give you an accurate result. There are times when the infrared reader on the monitor will need to be cleaned – you will know that your monitor sensor needs to be cleaned if the monitor screen displays a symbol that resembles a toothbrush.